With seven best-selling books to date, the Moda All-Stars are on a roll! 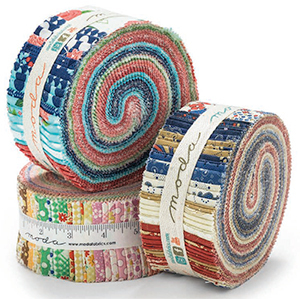 The famed designers are back with sparkling projects for irresistible Jelly Rolls, those coordinating 2½" strips of fabric that slash cutting time and speed up sewing time. 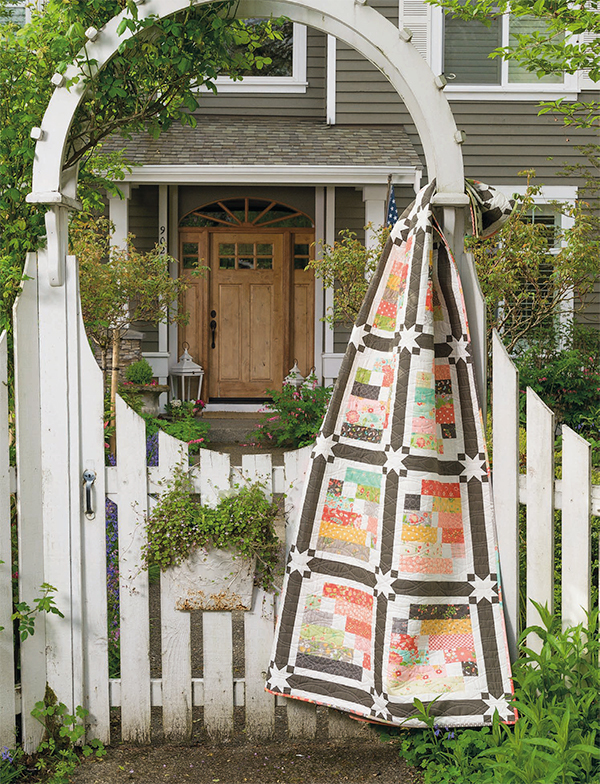 Let the good times roll with 14 quilt patterns created by favorite Moda designers, including Lisa Bongean, Betsy Chutchian, Joanna Figueroa, Sandy Klop, and Anne Sutton. From simple and classic to fresh and contemporary, you’ll find a beautiful quilt that will inspire you to get the ball rolling! Did you know? For all books in the “Moda All-Stars” series, the designers and team from Moda have donated their royalties to different charities. 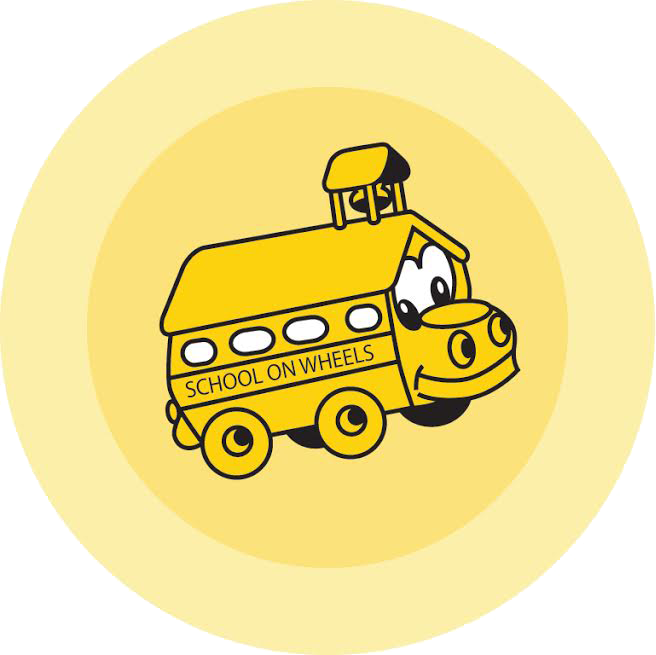 Royalties from the sale of Moda All-Stars: On a Roll will be donated to School on Wheels, a nonprofit organization that provides academic tutoring to children living in shelters, motels, cars, group foster homes, and on the streets in Southern California. Their goal is to help children achieve educational success so that they can break the cycle of homelessness and poverty. So, what’s the VERY FIRST THING the Moda All-Stars do when they’re ready to make a quilt with a Jelly Roll? We asked them! Sandy Klop jumps right in and starts sewing—she loves that there’s no need to press or cut. Lynne Hagmeier lays out all the strips to see the ratio of lights and darks and the mix of print sizes. Sherri McConnell unrolls the strips and separates them by color. Barbara Groves and Mary Jacobson of Me and My Sister Designs put on their pajama pants plus comfy, well-worn shirts and make sure to have Starbucks tea and a bag of chocolate-covered peanuts at the ready! Karla Eisenach cuts and pairs Jelly Roll pieces that coordinate before she starts sewing, so that she’s not left with all the same prints for the last few blocks or units. Brigitte Heitland picks randomly from her Jelly Roll strips, adjusting fabric combinations as she goes. Corey Yoder mixes her approach: some quilts are totally unplanned and scrappy, others are pieced with a little bit of a plan. Stacy Iest Hsu unrolls and sorts by color to see what she has to work with. Linzee McCray is a fan of random—she love mixing up her strips! Janet Clare unrolls and admires all the strips, leaves them in a muddle, and goes from there. Anne Sutton begins by sorting all the strips by color. Joanna Figueroa prefers to pet them rolled up—but if she has to unroll, she starts by arranging the strips into pairs. Betsy Chutchian uses a lint roller or packing tape to remove the fuzzy fluff from the edges; then she unrolls and presses each strip after spraying with starch. Now that you know a few All-Star secrets for starting a Jelly Roll quilt, you’re all set to sew—but you’ll need Moda All-Stars: On a Roll AND a Jelly Roll first! Our pals at Moda Fabrics have got three of you covered: they sent us three sweet Jelly Rolls to give to three lucky winners today! One winner will receive the Roses & Chocolate Jelly Roll by Moda (top); one winner will snag the Circulus Jelly Roll designed by Jen Kingwell (center); and one winner will get the Woof Woof Jelly Roll designed by Stacy Iest Hsu—and all three winners will receive a copy of Moda All-Stars: On a Roll, of course! What’s your favorite type of Jelly Roll? One strip of everything, please! Some repeats, so I have variety but fewer prints. I love the single-color rolls—those I can work with! We’ll choose three random winners one week from today and let you know by email if you win. Good luck! And if you’re ready to roll with the All-Stars right now, you can purchase Moda All-Stars: On a Roll at our website and instantly download the eBook for free. I love having a couple of each strip so my project can be a little more controlled in scrappyness. The solids are great for sashing or background strips, too. Love jelly rolls with some repeats. One strip of everything! The more prints the better. I like a few of each strip. There’s always one you want more of. Well, I really like all of them. Just depends upon what I want to make at the time, as to what works best for that project. Sometimes you need a roll all the same color and a mixed roll for a full project. I am not picky at all – will take anything that I can use. I love, love, love all precuts. They are addictive. I love the repeats cause the material is always so pretty, I want more of it! Two strips of each . . . but truly, any kind of jelly roll is absolutely irresistible to me! They just sing to me when I see them in the quilt shops and beg to come home with me – how can I say no? Love this book – it may have to come home with me as well! I like the ones with some repeats, but one of each is good as well. I love a bright, happy jelly roll. If I can get it on sale that’s a really great treat. I like a jelly roll with some repeats. I love all jelly rolls. Have used the solid ones for sashing. Prefer the ones with one-of-everything. Gives me a chance to enjoy a complete collection of fabric from a designer without having to spend a fortune buying fat quarters. I love some repeats in the jelly roll. This gives me more options to create. I usually sort light to dark. Love the time saving from no cutting and the variety of colors. I’ve never used jelly rolls before, but I would like one strip of everything to get the variety. I like variety. One strip of everything. I love all jelly rolls, but I work best from the solids because those let me do multiple things for several quilts. Such talented people. Beautiful fabric. I love jelly rolls especially the ones with 40 different strips. There are so many patterns out there for them. One strip of everything please! I like jelly rolls that have repeats. One of everything please! I like the variety that precuts quickly add to my stash. I like one strip of everything! I love seeing the variety and I love the scrappy vibe it brings to a project. I love variety so give me one strip of each, please! I Like a variety of repeats. Jelly rolls are the best! I prefer jelly with some repeats. One strip of everything for variety in my scrap quilts. Jelly rolls with some repeats. Feels a little more organized. One strip of everything please. More colour, more fun! I love to make stars from all the strips and also 2 1/2 “ tall tumblers. One of each fabric- the more the merrier! One strip of everything..I like variety and scrappy! I love scrappy quilts so one strip of each fabric is my favorite. One of everything! So much fun working with so much variety. I love scrappy quilts so one strip of each fabric is my favorite. These are some beautiful quilts. I love one of each fabric, although repeats work as well! These quilt designs are fabulous. I would love to have this book! I love all types of jelly rolls. It is great when a fabric line has at least one of each of the line. Can’t wait to get this book and make some of the quilts in it. It looks wonderful! Unlike my sewing room, jelly rolls are so tidy and organized. They provide such a great jumping off point when I feel overwhelmed. This book looks GREAT! I love jelly rolls of all kinds -they just make it so much faster to finish a quilt since it cuts down on the cutting time! I like lots of variety, but will use and enjoy any of the jelly roll styles! I love the single colors one of each and I love that they all go together.Makes it so easy to put together. •	One strip of everything, please! I love having one strip of each fabric. It save you from the embarrassing moment at the end when you realize the last two strips are the same fabric but the pattern calls for two different fabrics. I love all jelly rolls! They are all used for a purpose! Hard choice! Repeats or one solid color would be my preferences. I love one of each print for as much variety as possible!! But I just love jelly rolls period! Even to decorate my sewing room with. I’m excited about the book. Really love variety, so lots of everything. Scrappy quilts are a favorite and pre-cuts make it easier. I like all types of jelly rolls. Variety is the spice of life when it comes to jelly rolls. Like the quilts offered in the book as well. Jelly rolls with repeats! Sometimes one is not enough! I would like to have one of every fabric from the collection in a jelly roll. This looks like a faublous book with some really great quilts. Thanks for the chance to win. I like a jelly roll with some duplicates for a controlled look. Love books using jelly rolls for fast quilts. I love jelly rolls – I think I like one strip of everything. I have never used one colour jelly rolls. Love to have this book to add to my collection. Happy First Day of Spring! I like repeats. And the book looks great. I love making scrappy quilts! Some repeats are acceptable. Learning to love jelly rolls. My favorite jelly roll is one strip of everything please! i like a variety of colors or patterns on the strips, it makes the quilt look more interesting. i also like getting two different pattern rolls and combining them. What a great book! Love the chickens. I love every kind of jelly roll. It depends on the project I’m doing, but if I have to choose, I say one with the whole fabric line and less repeats. I luv variety so for me my favorite type of Jelly Roll is: one strip of everything, please! I prefer jelly rolls that have repeats of fabric patterns. I especially like the sample with gray as a background. I usually use white or black. The variety in one of everything rolls is perfect for scrappy quilts. You can always buy more fabric to coordinate especially if one particular print strikes your fancy. But one color rolls certainly can be useful too. One strip of everything please. variety is the spice of life. I love the jelly rolls with duplicate strips. I love the fabric so much I want to see more of it in my quilts. Just can’t get enough of a good jelly roll. I like to have a couple of matching strips of each. Seems to give me more options for design. Repeat, solids, whatever the case may be, I love them all! Jelly rolls, I love them all. If a roll attracts me, I buy it. If I am doing a specific project, I pick the one I need. If I need my fabric fix, I buy what I need in the future with no project in mind. I like the jelly rolls I use to have a few repeats but if they don’t i’m Ok with that also. Just having a pretty jelly roll makes me happy. I love them all!!! I like so gle , repeats and solids. They really work well when I want to be creative. Jelly rolls are exciting because you get to see all the different prints in a line of fabrics. But, I like some repeats because it makes the decisions easier. I would go with just one of each to get more variety, however sometimes you just need a little more so that second strip is needed. I would feel I would be like I was slighting the other jelly rolls if I have to pick 🙂 but if I had to pick it would be repeats. Some of everything! I like to mix and match too but I KNOW these fabrics will "play well" with others. Thanks! I would love a non-repeating jelly roll. I get a headache placing and re-placing strips because my OCD kicks in and this color is next to the same color but that print is identical to this one. Thanks for the chance to win! Having dupicates is best for making blocks. Only one of each is good if the entire quilt is just strips! If I had to choose a favorite, it would be one of each. The scrappier the better! Some of everything! I like several strips of each piece because I always like the next one better than the one before. I have trouble choosing my favorite. I like one of everything, then make them into a simple design to show off all the fabrics. Beautiful patterns and fabric! Would love! I like variety with prints and and blenders. i love all things jelly roll. i sort by color and spray and press each strip especially the very middle where they are rolled so tight. I love the Jelly Rolls because I am not good at coordinating colors. They do the work for me and I use the different types for the particular project I am working on. Keep them coming! I haven’t seen a jelly roll I don’t love ! The repeats sounds like a great idea !The On a Roll book looks wonderful !! Thanks for such a great giveaway ! Some with repeats works best with me. I like working with jellyrolls because there’s so little cutting. I love having the color ways already assembled. I’m terrible at picking colors. There are so many patterns out there for jellyrolls that it makes quilting with them a success. I love having a strip of each fabric. When I get my jelly roll I try to wait until I’m ready to use it but usually end up unrolling it so I can see all the fabrics! I use a small drying rack to hang the strips on. I’ve never purchased an all one color roll. There aren’t many available in my area. I love the one or two strips of everything. WOW! Love the patterns in this book! I like some repeats because I need more of the same fabric than what is available in only one strip. Thank you to all of you for donating to a wonderful project! Quilt on! I like to have some repeats in the jelly roll although I do love the one color jelly rolls too. I prefer the single color rolls. Thank you for the opportunity. Here’s hoping! One strip of everything, please! I love the scrappy look this gives. I do like all types, and frequently buy them based upon the pattern I am using. Oh my, I love them all! The solid ones are great for instant bindings! And I love the variety in the other jelly rolls. Looks like a great book! I love one strip of everything. The scrappier the better. I love the variety. I would say, one or two of each fabric. I adore a scrappy roll!
! I love the book and fabrics! Thank you! I prefer 2 strips each as I like the continuity look. Lots of variety is good — but monochromatic variety (prints, etc., in same color) is very useful. One strip of everything, please! I love to see all the different but corresponding fabrics in the line. Definitely one strip of everything – the scrappier the better! I like one strip of everything! I live all the colors. I like a variety of prints. they make an Irish chain so pretty!! Im all ready to win.I have no experience with jelly rolls so Im hoping to win the book and a jelly roll. I love the quilts shown. I love the single repeat jelly rolls. Love variety! I too am addicted to precuts of all kinds, but i just can’t resist those jelly-rolls.I prefer some repeats because it seems to give me more options with design and color placement. The All-Stars have really designed some beautiful quilts and I can’t wait to win it or buy it!! How very wonderful that the All-Stars donate profits to such a great cause. I applaud them and the charity!! One strip of everything! This book is so exciting, I already see at least 3 quilts I want to make! One strip of each – love the variety! Some repeats, please! This books looks like one I really need! I love scrappy quilts, so my jelly roll of choice would be one of EVERYTHING!! Appreciate the opportunity to win these amazing prizes! Thank you! When it comesz to jelly rolls…I love the Batiks. Lots of bright colors! Depends on my project, but repeats are always fun. I like the multi-colored rolls so I have a good variety. I sort by color to make sure I don’t end up with duplicates near the end. I like both: one strip of everything and some repeats, so I have variety but fewer prints. I love them all! But I lean toward solid color (orange) because I want to make a pumpkin table runner and it is strip pieced (pattern by Bonnie Hunter) and purple because I want to make my sister-in-law (and best friend) a lap quilt and of course she loves purple! One strip of everything, please! What great fabrics, and that looks like a fantastic book! I like a few repeats but they are so beautiful it is hard to unroll them. Just want to buy them and put them on my shelves to enjoy the inspiration. One of each. Love the scrappy look! I like them with some repeats, but a variety. Really like to keep them rolled up as they are so pretty ! I love scrap quilts, so lots of variety is always nice for those. But I do love all the types, each has it’s own purpose. I LOVE jelly rolls! Some repeats is my favorite type. I use them all eventually. One strip of everything, please! Love having all the fabrics in the collection. I love them all! I am guilty of hoarding Jelly Rools! I like Jelly Rolls that have all different fabrics. I like the ones that some some of everything because I often want something larger than a lap quilt so if I add some of my own strips I can increase the variety. The single colors a great for sashing and for matching up with variety strips! I love jelly rolls! I get overwhelmed in fabric shops and need someone to help me choose and edit my fabrics. Jelly rolls with a few repeats are my favorites! I love jelly rolls. I like the different colors, and don’t mind repeats. I love a jelly roll that has a few repeats. I like having at least one strip of the entire collection for a good variety of fabrics and the values planned in the collection. I like a few of each strip. Fewer decisions on which one to use. Some symmetry is nice. I love all the jelly rolls I’ve purchased so far but do not like all those little fuzzy’s from the edge. I have read some of the comments here on how to cure that and will put those ideas to good use. Thanks everyone for such comments! I love jelly rolls! Variety but some repeats to pull it together. Small prints – not large. I’d love "The On a Roll" book. Lots of great patterns I want to do. I already know who I’d give some of them to and, of course, my favorite – that I would keep for me! All the fabrics in a line with some repeats would be my favorite. However, I am thrilled to use all one color for sashing, etc. Wait a minute. Maybe I just like the name Jelly Roll. When I did a serious reorganization of my stash I found 28 waiting to be transformed into a fabulous creation! I like to mix and match different rolls to get just the perfect blend of pattern and color for my quilt. I like the jelly rolls that have some repeats. The fabrics are really pretty and I can use them all in one project or add them to other projects. I love Jelly rolls and love when there is one from each fabric! Repeats are okay. I love using a solid with a designer one! I love variety but I find it helpful to get 2 strips of most prints. Love jelly rolls! I like variety, so I’d pick the one of everything option! I just love them all thank you for everything you do. Jelly Rolls are great! You can start sewing from the start. Thanks! All of the above??? lol! Depending on what I’m making, usually I’ll choose something with a few repeats. Like the Roses and Chocolate Jelly Roll, it’s gorgeous!! I do prefer some repeats. i love controlled scrappy quilts and l love working with jelly rolls. I like the variety of different prints and scales in analogous colors. I prefer repeats. Hate to run out of a print/color! One strip of everything so I will have lots of variety! Love the patterns in the book……. I love jelly rolls because each are such a fun surprise to unroll!! Then right to work!! The book really looks great – a wonderful aid in how to use up all those gorgeous jelly rolls in your stash! I truly love all types of jelly rolls. It depends on what my project is as to what type of jelly roll I use. Bur if I had to decide I would probably go with one of each fabric in the line – the more the merrier. Any Jelly Roll. All Jelly Rolls. I love them all. There should be a Nobel Prize for Jelly Rolls. I haven’t used one yet! Now I will! One of everything please – the more variety the better! One strip of each would be fantastic! My favorite jelly roll is Circulus Jelly Roll designed by Jen Kingwell – but would LOVE to be a recipient of any of them. The Moda All Stars series of books are sooo very awesome – great inspirtation and easy to follow instructions. A must for any quilter….and would love to have this newest one! Love them all. Keep some on hand ready for inspiration. Single colors work wonderful when you need some shashing. Beautiful expamples from the book. I love to choose a color combination that I do not have in my stash. It is freeing working with different colors. I love a strip of everything! The more variety the better to make the quilt POP! I love working with jelly rolls except for one thing;when they are not properly and a design is off, e.g., gingham checks. I consider those strips unusable. Also I don’t like too many repeats of any one fabric. Great book! Some repeats, so I have a variety but fewer prints. But I love them all. I like a couple of each pattern but the variety is what’s fun with a jelly roll! It depends on what I want to make. I have bought some of each kind of Jelly Roll. I like all of them. I love jelly rolls! All colors! They make me happy and are fun to use! I love to have a few repeats because they always manage to pick my favourites!!! So excited for this book!!! I have 4 projects picked out already! Thanks for the chance to win! I love Jelly Rolls. It saves so much time and you get a little of all fabrics. Like at least 2 of the same fabrics. Love the ones that are different shades of same color. I like some repeats. Love the Apricot Jelly quilt. I have never used rolls, but they look intriguing. I like repeats. There are great patterns in this new book for jelly rolls by the picture reviews. I am on a roll, excited about this book. I see a few quilts that I would like to make! I like everything in a jelly roll. Variety is great. Single color rolls are also needed for combining an everything roll. Thank you for your wonderful emails. I find it hard to coordinate colors, so some repeats, so I have variety but fewer prints. They are all wonderful but I prefer a couple of repeats. I like a few repeats. It’s great to be able to use a whole collection in smaller pieces so that it will all coordinate. What a great book for using jelly roll strips! My favorite jelly roll is one strip of everything. I love a little bit of everything so I get lots of variety! I love scrappy looking quilts. Another fun book, thanks for a chance to win! I love jelly rolls that sing with color, pattern and movement. Endless possibilities, perfect size – and leftover scraps – well they just have to go into my pinnie or appliqué basket. I never thought of this before. Looking back, I guess I like the ones with some repeats best. I really want the book! Sounds wonderful! Thanks for it! Love the variety of fabrics in a jelly roll! And the precision. I love the jelly rolls with some repeats and a good balance of light and dark prints. The solids are great for contrast, without the tedium of cutting strips. I like the variety of lots of prints with a few repeats. Jelly rolls are a fun way to see the whole fabric line. I really like them! One of each! More colors! Love it! I love one of each because of the variety! All of the quilts look fabulous! I can’t say that I have a favorite. Each type is useful for different types of patterns. But I lean toward the ones that are one strip of each fabric. Love to win a written copy of this book.N.Y. Love working with jelly rolls. Love the challenge of making them work for me, whether they are solids or patterns, there’s a place for all of them! One of each means more fabrics! What’s not to love. I love light to dark jellyrolls! I like a scrappy look, so prefer the rolls with one strip of everything. Have been known to buy matching yardage if there were some prints I especially loved or wanted to feature. this book looks wonderful! I love variety! One of the reasons I buy precuts is to get so many different fabrics in one bundle. Favorite is the complete line rolls – either way – solid or prints – they are all GREAT! I like the one of everything for the really scrappy look! The book looks wonderful! THe jelly rolls with a few repeats are my favorites. The new book looks fabulous. Thank you for the opportunity to win a copy. All jelly rolls are great starting points for quilts! One of each, please. These look yummy and have inspired me to go see what I have in my "not yet opened" Jelly Rolls..! I love quilting with jelly rolls. Although I love them all, I think I love the batiks most of all.lots of beautiful patterns in the book. Lots of great quilting fun. One strip of everything please. I love, love, love jelly rolls. Thank you for the giveaway. You are good people! Love them all, but I do like the repeated patterns, color coordination is not my best suit. I love any jelly roll but prefer a few repeats in each one! Love a a few repeats…. I like a strip of everything! I really like variety and scrappy look! Thanks for the giveaway! The books looks awesome! I like some repeats. This looks like a great book. I love having 2 or even 3 of the focus Fabrics (for example, the one that you put on the front of layer cakes or charm packs) but one of all the others. That way the main reason I pick a particular pre-cut pops out in my quilt. Thanks! For the most part I like jelly rolls with 1 strip of everything best. They all have their own use though. One of everything, Please! The Jelly Rolls have such a wild variety of colors. I definitely like variety, but with some repeats! I like everything, because all the colors go together! Love Jelly Rolls! Have used solids for sashings and prints for blocks. Have made camp quilts doing the Jelly Roll Race. Jelly Rolls with some repeats. One strip of everything, but I can work with anything! I like jelly rolls with variety, but I hate to unroll them. I just peek in on them until I find what I want to do. It depends on what I want to do with it. For a scrappy quilt I prefer everything. I like a lot of variety, so one of each is good. But I don’t mind some repeats! One of each…you can never have enough variety. I like 1 of each color or pattern, then I add to it from my stash as needed. The jelly roll is the best thing since sliced bread…lol. I have made many projects from quilts to purses…love the coordinated colors, my last purchase was the vosey roll by moda! Just as long as all the colors coordinate, I’m a happy quilter. I am not a big fan of lavender but would not pass it up if I liked the roll. I love the Cival War Colors and anything with dainty floral designs. I am just getting into Jelly Roll quilts and this book would be great for me and I like variety. The more variety the merrier, I say! I like one strip of everything–the scrappier the better! I prefer to have 2 of each fabric. That way my favorite one will be sure to be duplicated! I’m new to playing with jellyrolls. I love being able to use all the prints, and some repeats are a nice bonus. My favorite depend on what I am working on. Some times its one color. Some times its the collection that I love! They are just fun to work with. I like some repeats. This book would be wonderful to have! I like jelly rolls with some repeats. This makes the quilt interesting but not too busy. This looks like a great new book! I don’t mind some repeats, but I enjoy the variety of coordinated prints That come in most jelly rolls. I know my quilts will look great! I like when they are already coordinated for me. One of everything please!! Variety is the spice I love! I like one of everything for more variety. I’ve never used a solid jelly roll. One of everything, I like seeing every design in so many colors and how they all play together. Love that they all coordinate and yet are all so different. I just love them, however they come! I can’t choose just one type. Each is useful for a different purpose. No matter what kind, jelly rolls are addicting! I love the variety in the jelly rolls! I love a few repeats, so I have variety and number! I like seeing all the fabrics in a line. But, a roll of all the same fabric is super useful. I love a strip of everything in that particular collection!!! 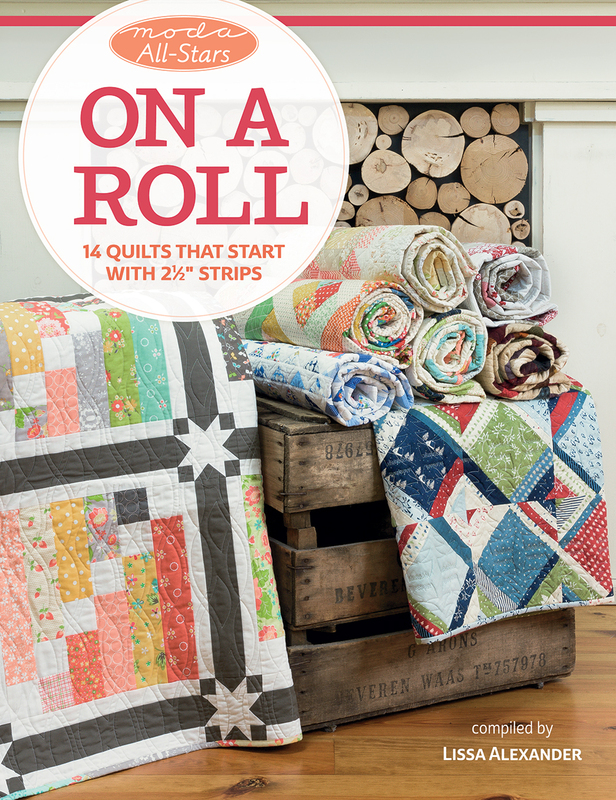 The book looks awesome and I can’t wait to get started on a jelly roll quilt now!!!! One stripe of everything! I like variety. I just love that jelly rolls eliminates the work for us. A roll of fabrics that works together to make a beautiful quilt. Variety is the spice of life. One strip of everything, please! I like a few repeats so there’s more coordination. One strip of everything, please! By the way I love the Chicken pattern in this book. I like them all. It just depends on the pattern I am making and what I am using them for. I like one strip of everything, and some repeats to make the total roll. I’ll take one strip of everything, thanks! And I love it when there’s lots of contrast! 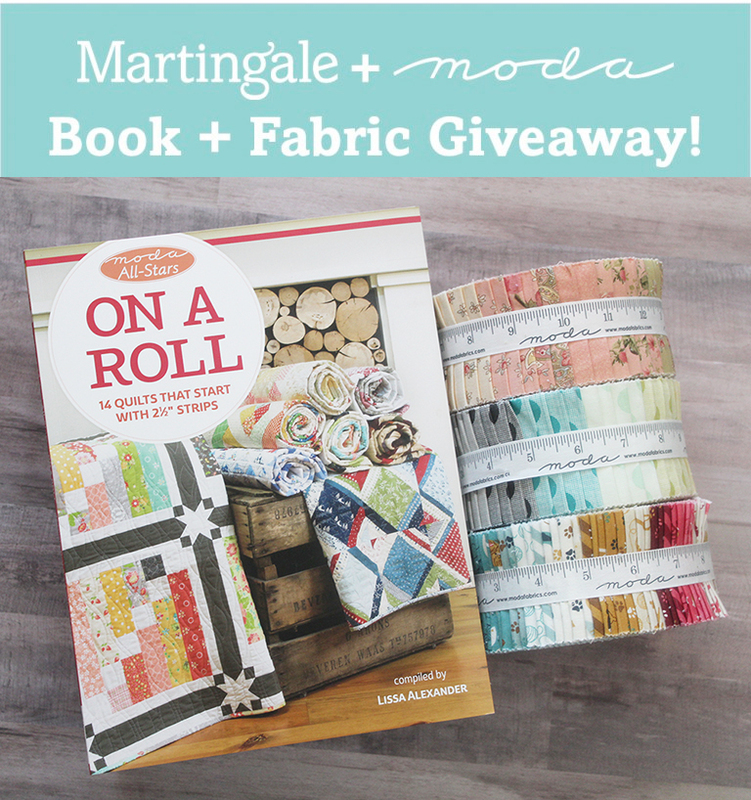 Thanks for the chance to win fabric and the Moda All Stars book! One strip of everything, the more variety the better. Love scrap quilts. Love variety. Lol thank you for a chance. Soilds thank you for a chance. One of everything, please! I love a good variety of color and prints! I like prints, repeating or singles. That roses and chocolate is classic moda yummy! It somewhat depends on what I am making, leaning to one of each!! Pick me!! Pick me!! I would like a variety with some repeats. These are wonderful. Thanks for the give a way. Love a strip of each of the line and a couple of coordinating solids. Jelly rolls are great. I love having a variety, especially when it’s a collection, the colors go together and ends up making a stunning quilt. Would love to win the book. I really like the variety of one strip of everything,although all one color strips would be wonderful for background strips. Love Moda fabrics too so would love to win this book and jelly roll prize. I prefer rolls with some repeats. I like a couple of each print so I can do more pairings for added scrappiness. I like as much variety as possible but don’t mind a few repeats. A couple of each, I like to coordinate pieces. I love that chicken pattern in the book; I would love to have that book in my collection. One strip of everything! I love scrappy quilts but having coordinating scrappy is even better! Love them all, especially floral and stripes. I love the ones with one strip of each. No repeats! One strip of everything please! I love scrappy quilts and this would be an easy way to get started. The book looks like a lot of fun to get into. Thanks for the chance to win. Most of the time I like one of each strip but really don’t mind some repeats. I love a strip of everything!!! I want to see the whole line. Love love jelly rolls! I have so many jelly rolls, but are having problems find good patterns for them. These patterns are such a good variety and would help make some beautiful quilts for gifts. I like all jelly rolls, but if I must pick a favorite I would say a variety with some duplicates. HI! like one strip of everything for variety in my scrap quilts. Thanks for a beautiful giveaway! One strip of every print in the collection (smaller collections would have some repeats). I love the way everything is all coordinated, no fail quilting! One strip of everything, please! Although, I am loving the look of the Circulus roll by Jen Kingwell! I like the repeats so there’s a variety of lights and darks but a repeat to tie the blocks together. I don’t mind either way, but I really love having a somewhat even distribution of lights and darks. I like one strip of everything. If I need I could put in som extra of my pen choise. I like some repeats please. Like a little of everything… colors, patterns, etc. Looks like a wonderful book. I love all colours and after taking quilt colour theory classes, I like to challenge myself with the colours I don’t wear! My family have lots of quilts now so I quilt with a group of ladies who make quilts for the charities in our county. It’s great. I prefer to have some repeats. It helps me to plan the focus fabrics in my quilt designs. I love a strip of everything to add variety to my quilts. I liked the suggestion for using tape to remove the fuzzy edges plus starch. Thanks for these ideas. I like the jelly roll that has a colorful collection on it. I love a scrappy quilt. More the color the better. I love a couple of strips of each. I always like making quilts with jelly rolls. My favorite type of jelly roll wold have to be one strip of everything. I love one strip of everything, so I can play play play. I like a roll with one of each fabric so I have tons of variety. Where I do mostly small quilts, this works perfect for me. I like jelly rolls that come with one of each fabric in a line. I do enjoy the occasional duplicate when there are not 40-42 fabrics in the group’ Those duplicates are nice for the extra and bonus projects. I only own one jelly roll. I like the variety. Thanks for this chance! I have a few jelly rolls- love to have them sitting out so I can see the lovely colors. Looking at them it seems I’m drawn to ones that have the full line in them. Have a couple of solid colored ones for backgrounds too. Great giveaway, book and a roll! I love Jelly rolls with mostly medium to dark fabrics, I don’t like the ‘void’ that lights leave in a pattern. I like that in all precuts and often buy a yard or add a solid to replace the light fabrics. I love having one of each fabric. I have quite a lot of them🤦‍♀️ The book looks like great fun. I want one of each fabric in the collection. If there needs to be repeats to make up the jelly roll, that’s okay. Which one? Individual, repeats, one colour? Please please don,t make me choose! I want them all !! I love very scrappy quilts so one strip of everything please. Are you kidding!?!?!?! I love ALL jelly rolls. Any color, any pattern, any amount of repeats. They cause my creativity to explode!! One strip of everything please. I love a scrappy quilt! There isn’t any jelly roll I DON’T like! I like the jelly roll to have different colored fabric strips. I have never worked with a solid roll – might have to try it. I like to have all different fabrics in a jelly roll. With single- or many-of-a-few fabric rolls I feel cheated in a way, or maybe bored. I want variety. I like to have some repeat strips in my jelly rolls. I’d love to win a jelly roll & especially the book. Thanks for the opportunity!! I like variety, so one strip of each, please. And, I love batiks! This book would be perfect for Quilts of Valor! Some repeats so I a varietybut fewer prints. One strip of everything please! The variety is so fun, and it would be really hard to pull together that kind of variety in a shopping trip. Thanks for the giveaway. I love one strip of everything but not all collections have 40 different patterns so I love when they give me doubles of the main prints. My twin sister & I quilt together—we like ALL jelly rolls but the variety is a fun way to have the full cellection & buy yardage of favorite for dashing & borders &, of course, we like to use a coordinating print for backing!! "One strip of everything, please!" I want to make every quilt in this book! They all look awesome. Thanks for the chance to win! My twin sister & I quilt together—we like ALL jelly rolls but the variety is a fun way to have the full collection & buy yardage of favorite for sashing & borders &, of course, we like to use a coordinating print for backing!! I like them all duplicates or not. I like variety and take the strips as they come! Then I get a lovely surprise! One of each please! Love the collections of fabric that goes together. I like a jelly roll to contain two strips of each print in a fabric collection. To decorate my sewing room I have a red cake stand with a glass dome that always holds one of my jelly rolls. Although I love to do scrappy quilts, don’t mind a few repeats in my choice of jelly rolls. Thanks for the chance to win. I love all of them! I’ve purchased scrappy quilt patterns, and haven’t tried them yet! Thanks for this opportunity, and have a great day! I like a strip of everything, but a few repeats would be nice too! I like the convenience of jelly rolls and all the patterns coordinate. Easy peasy! I love one of everything! The more variety, the better, I say. I love a super scrappy look! Definitely one strip of each fabric. The scrappier the quilt the happier I am. I love the jelly roll that has one of every fabric-no repeats. Love the variety and would love to win this wonderful book. I like to see every thing in the line and don’t mind repeats either. I love the variety rolls. I can be more creative. The scrappy the better so please one strip off everything! I love all jelly rolls. I’m not good at color coordinating, so it’s nice to know they will all go together. One strip of everything…I love the variety! I like to have some repeats, so I can highlight a dominant print in my design. I like jelly rolls that have two strips of each fabric, so there’s some repetition. One strip of everything. Variety is the spice of life. I would absolutely love to have On A Roll! 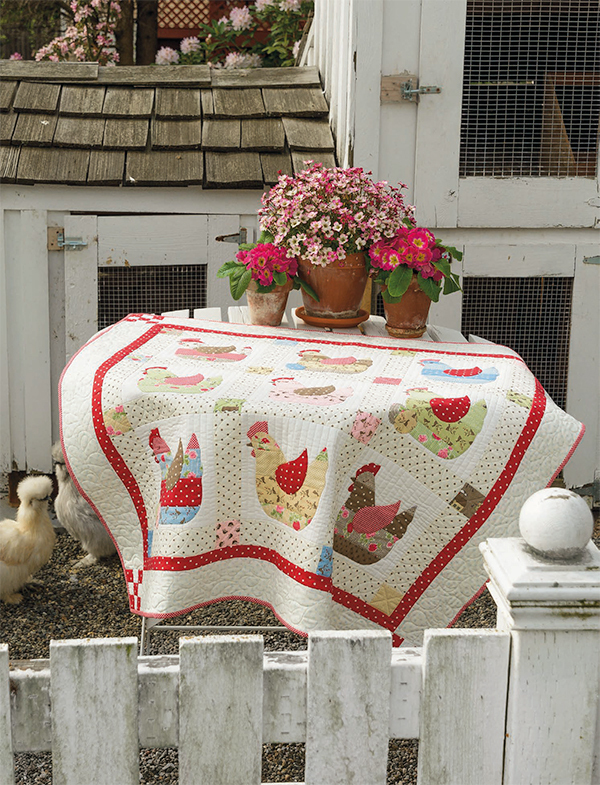 I love all the quilts, and especially the one with the chickens. I love all kinds of jelly rolls and have so many of them that I have lost count! One of everything! I don’t want to miss anything. I like variety so one strip of everything works great. But all jelly rolls are great!!! I love using a variety of strips so single strips are always welcome. I will always use a large variety of strips in my quilts. As I’m not much of a scrappy quilter, I prefer at least one repeat of each strip! I have never done a Jelly Roll Quilt and LOVE variety. One of everything please! I don’t mind a few repeats. 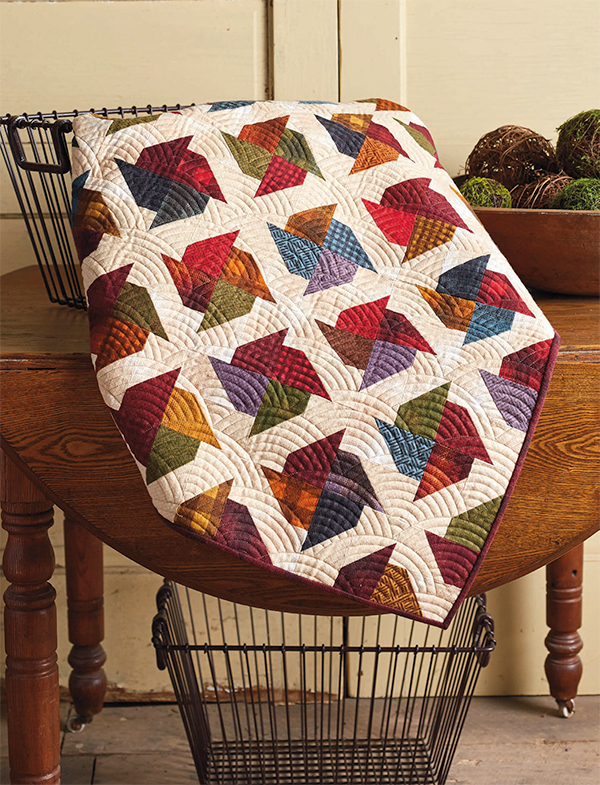 The What’s the Commotion by Lisa Bongean is a stunning quilted in the fan motif. I like a few repeats, but any jelly roll makes me happy! one of everything. I’m entering my 7th decade and it destined to be my "clean my scraps" before I start anything else!! I stick with Moda because of the 42 different prints. If I am cutting all 2 1/2″ X 4 1/2″ I have less trouble keeping the "mix mixed"! My favorite: One strip of everything, please! Variety is the spice of life! One of everything please. I’ve just gotten into scrappy and love it! Some repeats, so I have variety but fewer prints. These are the best! I with the "one of everything" crowd. I like my jelly rolls with lots of color…. I spin them round and round and it makes me happy!!!! I don’t mind the duplicates if the print is right!! It’s nice to see everything in the line. Jelly Rolls make it so easy to coordinate everything. It is then easy to add fabrics if pattern calls for large pieces. One strip of everything, please. And thanks to the designers and Moda for donating their profits to such a great cause! I like the variety of repeats. Helps you get symmetry across a quilt. And I like the variety. 😁 Thanks for the chance to win. Jelly rolls are my favorite! Love the way all the colors and patterns blend and play together so nicely! Some repeats so there is a variety. It’s so nice to have coordinating fabrics chosen for me. I like jelly rolls that have some repeats, so I can reuse favorite fabrics! I MUST have this book! I usually prefer jelly rolls with the entire line of fabric. If it involves repeats, that’s okay. Either one or two strips of everything. Scrappy quilts are so interesting. I like one of each in the line…except the coordinating solids! I’d rather have two of some of the prints instead of the solids! I have tons, bins and bins, of solids to mix with it. Hate to have to use a solid with my background instead of a print if the pattern requires use of the whole jelly roll, will tend to pull in a similar print if I have anything that might do. Have lots of orphan solid strips from jelly rolls…I do mix them in with other solid jelly rolls, so hopefully, I can use them eventually, but when there’s a bunch, I tend to feel like I didn’t get my money’s worth out of the jelly roll. At the price per strip, I want a pretty print! One strip of everything the more variety…. One strip of everything for the variety, although I don’t mind some repeats. I am not wild about the rolls that have 5 or more of the same. However, I truly have never met a jelly roll I didn’t like. Some repeats, just incase I need more than one strip!! Thanks for the giveaway. It depends on the project, but I usually want a strip of every fabric in the line. Love the variety! I like a couple of stops of everything!! I love a jelly roll. My preference is probably “ one of everything please”, but i DO like having a few repeats too…. close call to answer for me…. One strip of everything please and then maybe one of a solid, then I can combine the two to make an awesome jelly roll quilt. I don’t mind a few repeats. For me, I like to have one strip of everything. I like the variety. Sometimes I like to use a solid color jelly roll with the everything roll. I’m a scrap quilter, so I prefer the greatest variety of prints and colors possible. So, one strip of everything, please. I just finished my first jelly roll quilt and found I was wishing it had all different prints instead of 2 of each. Still, it was a good variety and I loved having coordinating prints already chosen for me. One strip of everything! Although, sometimes having one color for sashing is great. And I could use a win on this because the guild is having challenge this year with gelly rolls to be finished by December! And the book looks like a wonderful addition to the library. I love the Moda themed colour jelly rolls. The Christmas colours are so rich and make vibrant quilts. One of EVERYTHING! The more…the merrier. You mean I have to pick? I love them all! But since you insist, I’d go for the one of each fabric in the line so I don’t have to choose just one favorite to pet! Looking forward to actually using some of my jelly rolls with this book (don’t tell them though, they think I’ll treasure them forever in their rolled up splendor) Thanks for the chance to win another roll and the book! I prefer the solid colors because I can integrate my scraps with them. I also like the variety especially in a new collection of fabrics. I like a jelly roll with 1 strip of everything for lots of variety and a scrappy feel. One strip of everything is my favorite! Even better, pairing that with a single color roll that coordinates! The more colors and patterns in the fabric strips the better. I have never used a jelly roll so I would like one strip of every thing, please. I like my jelly rolls with one or two of each fabric. I have not worked with solid jellies yet. I am a huge fan of precuts. One strip of everything please — I like lots of different fabrics. One strip of everything please! These are some beautiful quilts in this book! Scrappy quilts are my thing. So I want a jelly roll with lots of variety. I love a nice colorful jelly roll! One strip of everything is perfect for me!! That’s a hard question. I have several jelly rolls, but have yet to use one; they’re too pretty! I would like one of every color but I also want multiples of the colors I really like. So the Jelly Roll needs to have more strips in it than it currently does. Do you think anyone will do that? Wouldn’t that be nice. I love my jelly rolls to have one strip of each fabric in the collection. The more prints, the better, I say! One strip of everything for me!! While I prefer to have no repeats, I’m happy working with almost any jelly roll! Love these quilts, and would be thrilled to win the book. Winning a jelly roll too would be icing on the cake. YES! I like them all. All jelly rolls are great and versital but my favorites have maybe two of each pattern or color. I am really attracted to batiks and traditional prints but really love most styles. I prefer to have a variety…a roll with some of the same and few prints. Love jelly rolls! One of everything, please! Like variety. I like the variety in the jelly rolls I guess because I like scrappy. I do get some of the basic single colors for sashing. I don’t mind a few repeats! How generous your designers are! Another example of how caring quilters are!! Good mix of colour values for variety. I like jelly rolls that have some repeats. Oh, I hope I am a winner! I don’t mind repeats. The featured quilts look like they will be so much fun to make. I am definitely a "more the merrier" kind of quilter. I love the variety in Jelly Rolls. Love jelly rolls repeats yes no cut no iron just sew sew sew . I almost always buy a jelly roll when I buy a collection of a new line, whether it be a layer cake or a fat quarter stack. The strips can be used for sashing, and or borders and binding! I like 1 piece of everything so I have great variety. Would love to be a winner in this give-away. I’m drawn by the colors and the type of prints – just like any other cut of fabric. If it’s a historic print or has muted pinks, blues, greens or neutrals, it will grab my eye. I haven’t worked with them enough to have strong preferences about repeats vs one of everything. I would love some repeats and fewer prints. Jelly rolls are so fun to work with and would love to make a few from your new book! Jelly rolls that have one strip of everything are my choice. I love scrap quilts. I like one of everything, although I do not mind having some repeats. The patterns in the book look lovely. Thank you for the giveaway opportunity. I think the charity that was chosen for the profits from this book sound wonderful and was a great choice. I love random scrappy variety . . .my jellyrolls get sorted by color – even if I’m focusing on a certain line of fabric, I like to add some from different designers/collections, too. I do like some of the same AND a few prints. If the jelly roll contains alot of my favorite colors I go for it. Not too many repeats though. Scrap quilts are my favorite. I love jelly rolls that gave one of each print. I have trouble selecting a large number of prints on my own, so jelly rolls are something I find a real blessing. The new books look great and I would love to own any of them. Thanks for offering the giveaway. I love them all!! But one with each print & a Bella solid one or a Bella solid & one with repeats!!! They are So handy!! I like all three choices. The solid (aka white) is great for latticing so I don’t have to cut a ton of strips. Depending on the pattern I choose, I like the variety of one of everything or the multiples of some strips. Thanks for showcasing this book and for the great giveaway. I saw directions for “Keyhole” quilt, not in this book, but it looked great and used jelly rolls. It was the first one that I thought I might be able to make, so I’ve collected a few prints and solids but haven’t tried yet. I love the largest variety possible. The scrappier the better! In my jelly roll I like one of everything with no duplicates. It adds such a sense of variety. The different quilts on the site make me eager to use a jellyroll. Something I have never done but I do love scrappy quilts! I would like to have a variety of prints that will play well together. I do like to have a big variety of colours and also some contrast of dark and light to make pairing up fun. I love jellyrolls with one strip of everything and don’t repeats. I would definitely choose all different strips, I love lots of color and print variation! One or two of everything. Sometimes you just need a little repeat. I would some repeats, have variety in each jelly roll. I like to mix and match with strips. One of each please. If we’re getting scrappy, let’s go all the way! I like a variety of fabrics in my Jelly Roll. I am particularly fond of Batik fabrics. I have only used rolls with 2 strips of each fabric. They work well. I like to have some dark and some light. All different fabrics would be good for scrap quilts though. One strip of everything, please. The more prints, the merrier!!! Gosh, I’ll take one of each. Helps with the scrappy look. I love scrappy! One of each print! Just challenged my quilting group to make jelly roll quilts! So ma y different patterns. Live the new book and jelly roll! I love the multi-colored, especially florals, with matching single-colored strips. I like a jelly roll with a good mix of lights, mediums and darks for balance in pairing in my strip sets. One of each or a few repeats are the best for that controlled scrappy look! Variety is the spice of life …. one of everything, please. I love all kinds of jelly rolls because I love fabrics!!! I love bright colors with high contrast! The book looks beautiful! I buy precuts when I want just one strip of a lot of different prints for a scrappy look. When I want multiples of just a few prints, I will buy yardage and cut my own strips. I strip of everything if it can be done. I love when a jelly roll has one of everything. Easier to sort, match for designs when not dealing with doubles or triples of one or more. One of everything please! I am so excited about this book, such cute patterns and.fabric! Jelly rolls are see versatile and great for quick piecing! I love a strip of everything, but don’t mind getting doubles of a few, especially any solids or "read as solids" that are included in the collection! One strip of everything please – solid colours or patterns. Ta. I love getting one strip of everything! I like precuts with variety. I can always find a fabric to bring it all together. Right now, I prefer fabrics with bright colors. One strip of everything with a couple of repeats! And I love Janet Clare’s leaving them “in a muddle”! I wish I could “middle” as effectively as these designers! One of everything…love a good variety! I love jelly rolls with some strip repeats. It’s fun to look for them throughout the quilt. Some repeats—and with some solid colors or blenders, as well. I would like to enter the "Ready to roll contest. I love piece quilting, but I don’t have as much time as I use to. I’m anxious to try the jelly roll! I love 1 strip of everything but think it would be fun to do a single color! Another winner! Love those rolls and new book! Some repeats would be my choice. Love the quilts, who knew you could do so much with a Jelly Roll? This book has so many unique and fun new quilts using 2 1/2” strips! Can’t wait to get my hands on a copy! Sooo beautiful! I am such a sucker for jelly rolls! They never fail to make me smile! One strip of everything please. Just love variety. And those gorgeous quilts! I like rolls that have a 3-1 ratio of darks to lights. Prefer creams over whites. And rich colors for the main color palette. Colors that will stand out in any pattern! Hard to answer your question. It depends on my project. I love a white/cream jelly rolls to match my fabric choice. Sometimes a whole collection works. When it first I will buy extra of my favorites in the collection to fit my pattern. Thanking you for the opportunity to participate in your giveaway. Thanking Moda for their part too. Another perfect partnership. I have never made a jelly roll quilt before. It looks interesting and fun! I think I would prefer some repeats in the roll. One strip of everything please. When I first started to buy fabric a quilt shop owner suggested jelly rolls because they are easy to work with, have a great coordinated grouping of colors and prints, and have endless possibilities. I can’t agree more. I love everything Jen Kingwell does. She just makes color work. I like the one of everything jelly rolls. I’m excited about this s book! It’s nice to have some repeats in a roll but I will take them anyway I get them. I like one of everything. Thanks!! I don’t have a favorite jelly roll as I have never bought one yet. I have watched yotube and how to make jelly roll rugs. I would really like to give that a try. Love those quilts! Please enter me for a chance to win a jelly roll. I love them all, I don’t have a favorite jellyroll. One strip of everything please!!! Yummy yummy fabrics! And oh that book. We Need that book! I love jelly rolls of all kinds but especially think I would say a few repeats of each strip. One strip of everything, please. Thankyou for the opportunity to be so lucky! Love the colors and that they all coordinate!! I like jelly rolls with some repeats. Love this prize what an opportunity to ein such lovely items. I erfers colors but also circles fascinate me. Thank you for the offer. I love jelly rolls. I like a few repeats with plenty of variety! This book looks awesome! I really like when there are a couple of each in a jelly roll. More variety! Prefer a jelly roll with only one of each, but sometimes two of each is useful also. Love the lint roller idea, those jelly rolls leave a mess! Love Jelly rolls and this moda All Stars ON A ROLL looks inviting. I reall like the colors but the circles intrigue me also. Thanks for prize oppotunity. Jelly rolls are an inspiration. No cutting, lots of variation, just create! My favorite jello roll is one in many shades blue, with no other color. I haven’t had a jelly roll yet! I am eager to try one! I like jelly rolls when I need lots of 2.5″ sqs of same print. One strip of everything. I love a scrappy quilt. Choose? Between all one color, one of every print in the collection, or some repeating prints? That’s like asking me to choose my favorite child. Every jelly roll is wonderful! Sew excited about this book. And getting new jelly rolls too! Can’t wait to stitch up a batch!! One strip of everything, please! I absolutely love variety!!! I love colors so Me and My Sister fabric lines are some of my favorites. I like a few repeats, love brights! I like a wide variety of fabrics. One strip of each. The more the merrier. Sew excited about this new book and Getting some new jelly rolls. Can’t wait to stitch up a batch of new quilts. Absolutely love the repeats in a jelly roll. Bright, beautiful and coordinated! I love them all. I’ve just not found a pattern book yet to make me want to un-roll them. Maybe this quilt book is what I need! A few repeats. My favourite. Love the patterns in the book! Could use up so many of my jelly rolls. I love jelly roll with all different fabrics. One of everything is the best. Makes it easier to incorporate scraps from other quilts. Precuts are the best. Some repeats for me, I think it makes the design! A roll of everything – so refreshing! I love getting them all, but each definitely has its place in quilting. Oooo! New Moda book!and for Jellyrolls!! Love, Love, Love it! Cant wait to win! It’s a needful thing dont ya know. I love a roll of everything – so refreshing! And I love to make my own of the color or style I want. My favorite jelly roll is “one of everything”, please! Oooo! A new Moda book. Can’t wait to get started. On all the new projects. YUMMY! Precuts are my favorite gift to my sister as we quilt together. One of everything is the best. Makes it easier to incorporate scraps from other quilts. Precuts are the best. I need to make a quilt yet for 1 grandchild. So many of these would be perfect! Thanks for the opportunity to win. First of all I love Martindale’s books and Moda is my favorite fabric. I was just given a small Jellyroll pack of 20 and asked by a friend to do a challenge quilt to see what I come up with. I have bought Jellyrolls for inside borders and binding. I have a couple ideas but this “All stars” would be perfect! Thanks for this opportunity to win. One strip of everything – please. One of every strip, please! Excellent giveaway!! I like scrappy so one strip of everything, please. One strip of everything please! I love lots of prints and variety!! I love the single color/same hues kind of jelly rolls so I can blend with additional jelly roll color to coordinate with my room decor. One of everything – even the cover of this book is inspiring me!! I love the prints. My very first quilt was a Jelly Roll race made with French General prints. The experience launched me in to using Jelly Rolls and other precuts. I have found the process of choosing a Jelly Roll and the pattern is exciting to me. I believe and recently read as well that working with your hands keeps you young! Variety is a great jelly roll. I like ever type of jelly roll! Colours and patterns are all used in my quilts. One of each please, I love, love , love the variety! One strip of everything please! Thank you for this opportunity! I like to have a couple of each fabric! Cannot wait for the book. I have never bought a jelly roll, so can’t say which type I’d like. All the quilts in the new book look so fresh and happy! Would love to win!! 1 of every color, please! I love all kinds of jelly rolls. I am crushing on how diverse the quilts are in this book. It is amazing. Kelly rolls make scrap quilts more interesting. Thank you for the chance to be a winner. I love the variety jelly rolls give, but can make any work. I like a variety–so one strip of everything please. I keep some solid color jelly rolls on hand for convience, but I really love opening up a new one with lots of designs! I love the variety of all different fabrics. Oh my gosh, what a wonderful book. I’ve never used jelly rolls, only charms. This would be so awesome to win for a chance to try them out. Thank you so much for the giveaway opportunity. I love scrap-type quilts…which jelly rolls are PERFECT for! I at times make my own…but boughten are wonderful AND make great quilter gifts also. I like jelly rolls with a variety of prints and colors and to fill in with strips of my own to get a great look. I love jelly rolls with doubles of each print. Gives me variety but some uniformity. One strip of everything for sure, lots of variety please! All of them! I just love jelly rolls. One strip of everything please. Love seeing all those yummy colours together. I love scrap type quilts and Moda jelly rolls are PERFECT! I love a good combination of lights and darks AND one strip of as many as I can get! Love your new book! 1. Solid for binding or sashing. My favorite jelly rolls have a few repeats. One strip of everything, each strip different! I love the variety of colours and prints. I love variety and Jelly Rolls! The books has some great quilts and I’m already planning to do several. Jelly rolls are the best! You get so many fabric patterns in one roll. Such a fun way to make a quilt! I love one color of each. jelly Rolls are so much fun to work with. Thanks for the giveaway and Happy Spring! I want to make all the quilts In this book! Gorgeous!! More is always better!! so I like 1 strip of everything for variety …then I buy yardage of the fabrics I want more of in my quilt! Love, love fabric designs and color–love different strops! Love ❤️ this book and the beautiful quilts all for my favorite precuts. I love when everyone is a different color/piece to get each one of a collection. I love jelly rolls for the versatility they give. Preferance is at least two of each! I like 1 of everything so that I can really make it scrappy looking. It challenges me to balance my colors in a quilt. One of each print for variety! I prefer the strips with repeats. I love pairing patterned strips with solid strips. Love a jelly roll with some repeating strips!!! Love to win this contest, thanks for this opportunity!! So pretty! Oh the endless possibilities! I love the printed ones with some repeats and some singles, prints! I like to have some repeats, and I love the solids for backgrounds. It’s a great timesaver! I love lots of variety! One of everything please! Lots of prints–one strip of everything! I like to have a couple of duplicates in my rolls. I also use some of my own fabrics in the collection to make the quilt "mine". Really like Lynn’s What’s the Commotion! I like some repeats but not too many prints. I like some solids or background fabrics mixed in. I prefer those with repeat strips but have used other kinds of jelly rolls as well. I like jelly rolls with all kinds of colors best. I like a variety in a jelly roll but some repeats are ok. I like repeats in my jelly rolls. I like jelly rolls with some duplicates. I prefer to have a repeat of each fabric. One strip of everything please; then I will sort by colors. This book is so wonderful, first thing I would make is Rule the Roost…my kitchen/dining area has many vintage roosters. Love them!! I actually like them all… but if I have to choose it would probably be one of everything for a really scrappy quilt. One strip of everything, please. Variety is the spice of life . . . and quilts. I can always add more solids as needed. This looks like a wonderful book! I like jelly rolls that have some repeats. Keeps me controlled as too many choices overwhelm me. I like a jelly roll with variety but a few repeats. One strip of everything is my favorite. One of everything, please! That’s the way I feel about the quilts in the book as well – they are all gorgeous! I have yet to see a jelly roll I didn’t like or want! I love a couple repeats in each roll! I never met a Jelly Roll that I didn’t like! But I am a bit partial to a strip of each print. Some repeats are nice-I like a variety of colors and patterns! I love one strip of everything. The more the merrier. Definitely one strip of everything! It means I don’t have to stress over randomm. For me, when it concerns jelly rolls, “the more, the merrier!” I love a wide assortment of patterns and colors. I love having jelly roll strips with repeats! I like jellyrolls that have a wide variety of a complete line of fabric & not too many repeats. Hmmm. The problem is……I want them all. So little time, so many quilts left to make. I like all kinds of jelly rolls ! I do like when they have a variety. I like a jelly roll with one of each print. It gives me a sample of the entire line, which helps me select yardage for backing or borders. Truthfully, the ones that are free!! But seriously, all three are good. It just depends on what pattern you are using them for. Great quilts! I see 3 I want to make right now!! I have several Jellyrolls that need a pattern I like. I prefer rolls that include the entire fabric line & not too many repeats. I have only ever used one Jellyroll, however I definitely would want them all different, or just a cpl the same if the line was not that large. I love having two strips of each print. Love the patterns in the new book. Favorite Jelly roll definitely some repeats, so I have variety but fewer prints. This looks like so much fun! I like the One strip of each best. Like a box of chocolates-you get to sample a little of each. Thank you for the giveaway!! I like one of each for more variety. I enjoy a roll with lots of color! Such a cute book! One strip of everything is my fave. But a few repeats is nice. And a solid color is perfect when you need background. Guess I love them all. I love the convenience of jelly rolls! Rolls with repeats most fit my style. Love jelly rolls and I don’t mind duplicate strips. A Moda jelly roll is like frosting on a cake!! I love a coordinated scrappy look, jelly rolls are perfect! One strip of everything! The more variety the better. I love the jelly rolls with a few repeats. I love being able to jump right into my project! I love having one strip of each color in the line. It helps make your project more scrappy! I love jelly rolls!! All three ways! I probably like one of each print the best. I like one of everyone so I can see more of the roll. From there I pick my most favorite ones and usually buy more of those fabrics. Would love to win the awesome prize. Some repeats..so I have variety but fewer prints. (The fewer choices I have to make the faster things go together.) What a great book…LOVE those chickens! Thanks for featuring it! Jelly rolls make quilting easy and also challenges ones creativity. I love sewing with jelly rolls and my favs are lots of different prints. The colors make me happy!!! Thanks for the chance! My problem is I love them all! I guess I’d pick a more modern look, I seem to be leaning that way recently.. I’m loving the deep bold colors of Alison Glass, Tula, Juicy Juice & I love Moda Grunge! One strip of everything please!!! I like repeats of several so that I can choose my combinations easily. Great way to make a scrap quilt! I have a Jelly Roll fetish …I just can’t resist them! I love the music all.! But if I had to pick just one, I would probably say " one strip of everything". I love the one strip of everything. Once I find my favorites I will purchase some yardage to use for backing and some for future projects. One strip of everything, please! Love the variety! Some of everything in a collection… great if there is a couple repeats! Also like Co-ordinating solids! Ooh la la! Always love a jelly roll! I prefer scrappy-1 strip of multiple colors. I have rolls that need to be used, but I need inspiration. Looking forward to the book. I like to have a couple of each color. The book looks awesome too! One strip of everything please, the more prints the merrier!! My favorite? Well my answer is yes to any! They’re ALL my favorites! I think some repeats are fine, but of course one strip of everything is perfect, too! Single color saves me a ton of time! I’m really enjoying these books … hope to win this one! Thanks for the opportunity! I love having repeats of some prints in a jelly roll. One strip of everything! I buy two rolls! One strip of every, please! Thanks! One strip of everything please!!! I loooove jelly rolls! I love every single quilt especially the chicken quilt. I can’t turn a chicken or a rooster down. I think anyone would love to have any of these quilts. Beautiful job on all your quilts. I love the variety with some repeats! Any Moda jelly role is my favorite!! I like to get a jelly roll that has one of each fabric in a line of fabric. I love scrappy! I love jelly rolls that have one of each print, the more variety the better! I don’t think I have seen a jelly roll that I didn’t like. The book has really sparked my interest. One of each for me, I love scrappy! Love ❤️ the book too,I have to make the chicken quilt first! ✂️IIdeas limited only by the number os scrips- one strip of everything! I love coordinating sets, mix and match. I love one strip of everything! The scrappy look is fantastic and so much fun! Of course, if it’s Moda Fabric then it’s always fabulous! I like all kinds of jelly rolls. Love the colors to work with. I lIke for the jelly rolls to have 1 color of each. Looks like a wonderful book!! All of the shown patterns are winners. I’m impressed with the designs and would love to own this book! It would depend on what I am making, but since I lean towards scrappy, I’d take a roll with one of everything. So gracious and generous of these ladies to donate their royalties to charity. I like some repeats! I actually love all of them though. Onde strip of everything, please! I love the rolls with a few extra repeats in the prints, expecially in the lighter colors, so I can use them as backgrounds. Love the looks of the book!! I love it when a jelly roll is full of different fabrics. I like a variety, enjoy using all of them. I love precuts! I’d really like a variety and one of each print in the grouping as long as that happens I don’t mind a repete. I don’t want all Solids and numerous repeats. Thanks for the chance, some great patterns in the book. I prefer a wide variety with one of each print, with maybe some repeats of the core colours in the collection. I like jellyrolls with repeats. The repeats allow me to control the flow of colors and design throughout the quilt and provide consistency in pattern and style. Also, if there are enough of like patterns left over, I use them to make matching throw pillows or pillow covers. Jellyrolls with repeats make quilt designing a breeze! I like one stripe of everything please! One strip of everything. I love the variety and scrappiness ! Looks like a great book! Love the apricot jelly! This looks a super fun book😁. I’m already planning the “rule the roost” chickens… very cool! Thanks for sharing! I like jelly rolls with a few repeats but at least one of each print. They are just so fun with a few repeats. It sort of depends on what quilt I make but I love a variety to select how they go together. I like to have some repeats, but no more then two of each strip. I have never used a jellyroll, but would like to try one, I have a question though, I know they have a pinked edge, do you use the outer pointy edge or the inner V to sew a 1/4″ seam? One strip of everything please! Thanks for the chance to win! I’ve never bought a jelly roll but I think one with a large variety of prints would be fun. My favorite jelly roll has one strip of everything, I do like a few repeats too. My favourite JR is one that is bursting with colour. One of each, please. I would love to have this book. Thank you. I love the variety, so one strip of everything. All kinds of jelly rolls! I want one of each fabric in the line! I’ll buy yardage of my favorites to finish a quilt. The book looks fabulous. Great job! A few repeats is fine. I like a slightly disorganized look to my oraganization. I usually like the rolls with one of each, but I have used those that are all one color. Just depends on the project. One strip of everything please and coordinating fabric for the borders. I love a jelly roll with every strip a different fabric… variety is the spice of life … and quilts! I love most jelly rolls! I prefer 1 of each print please! Definitely 1 strip of everything!!! I prefer 1 of each print. It makes for a more interesting project. I have lots of jelly rolls waiting for this book. I usually buy enough for 20 charity quilts every year so this would be perfect. One strip of everything please. Thanks for the giveaway!! One strip of each print. The more, the merrier! I like the jelly rolls that have one strip of everything. I love prints with some repeats, especially baticks. I usually like a few repeats, but not of everything…just the cutest ones. Lol. Thanks ! I love the ones that give a couple strips of each fabric. I love looking at a jelly roll side on and after a time unrolling it to see what extra magic is hiding inside the strips. I love one strip of everything! Truth be told I am just beginning to prefer fewer prints with multiples, but I’m not there 100% yet! One strip of each. I want variety. I prefer one strip of everything! I have never used a jelly roll, think this book gives enough inspiration to give it a try. MY favorite Jelly Roll would be one with fewer prints. I like to have a variety with some repeats. I almost always blend precut print rolls with solids and blenders to extend the selection. I love the "one strip of everything" sets! One strip of Everything, please. The more medium the better. I love random scrappy variety . I like to add some from different designers/collections, too. My favorit is mixing batik and prints. One of each – the more variety the merrier! I like having lots of different prints in the same color family, with a few repeats. I love to get a jelly roll with different light and shade so I can coordinate my colour combinations. I love to relish their beauty for awhile before separating them into pairs for a treasured project. I really like Jelly Rolls with "one strip of everything". However, I also use one-color Jelly Rolls for sashing/framing blocks or for planned secondary designs in a quilt! I would LUV to win a copy of "ON a Roll" and make some of these great quilts! Thanks for the giveaway opportunity! I love being able to have every color in the fabric line. That’s why I love precuts! Some repeats, so I have variety but fewer prints… I love making repeating blocks but vary in color and fabric patterns. Thanks for a great giveaway! One strip of everything please. Thanks for a chance to win. I love jelly rolls that are bright and fun, or especially ones that remind me of the water and the beach! Sometimes the fabric in a quilt alone can take you away to another place! I love jelly rolls made with one strip each of fabric. Especially love the Roses & Chocolate colors. I like them all, but single-color rolls the best. I love a strip of each with some repeats. Variety is great. I absolutely love this book. And of course the jelly rolls. I have always wanted to make a chicken quilt. This one is my favorite. My niece lives on a mini farm and has sheep and chickens. This quilt would be perfect for her. Then it would be so hard to pick another quilt to make. I love them all!!!!! I like one strip of everything. Thank you again for the opportunity to win! I like the ones that have the colors mixed. There’s so much you can do with them. I like some repeats in my jelly rolls. Thanks! My favorite jelly roll is one strip of everything. I love the scrappy/coordinated look! I love all types of precuts and there are so many jelly roll patterns available now that I would need several lifetimes to make all of the ones that I love. One strip of everything. Love scrappy without digging through my stash! I prefer one of each so I can really have a lot of colors and prints to choose from and knowing they all will look great together is a bonus. Lets you get started so much faster on a project. One of evert hingele please. I have "a few" solid strips from other projects that I use to supplement. It is the variety of prints that I drool over. I love one of everything. The more the merrier! I love fabric on a roll! So many options to work with. I like them all different but coordinating. I love one strip of everything. then I select the one I would like to use as background and purchase the yardage. Thank you for the opportunity to win this awesome package. I like two strips of each. I haven’t had much experience with jelly rolls to know what I like best, but since I love scrappy quilts, I think I would like to have one of each fabric in a roll. I love any kind of jelly roll that comes my way. They are all fun to work with! I like the repeats, it gives somewhat of a pattern if you are working on an non patterned top. One strip of everything. Please. I like as much variety within one color. I like a variety of prints. I can pair it with a white solid fabric or other solids. I definitely prefer a variety of strips—I love my quilts to be scrappy. I love all varieties of Jelly Rolls, however my top choice would be several repeats in the roll. Some repeats – but they are all pretty handy! I love rolls that have one strip of everything. I usually purchase two rolls so that I have enough of my favorite. Love to quilt with jelly rolls and other precut fabrics. One strip of everything-the more the merrier! Repeats please, always love having choices! I love one strip of everything! I love the jelly rolls with some repeats to allow for a small border if desired. Primitive are my go to favorites… all the rich but vintage color pallets; oh how I can’t get enough and the addiction is more than real. What a wonderful opportunity at an inspirational book!! I love one strip of everything – I like strippy quilts, doll quilts, baby quilts, baby bibs, baby burp pads, etc. Would love to win the book and srips!!! Love a variety but definitely need repeats! I’ve never used jelly rolls before but based on my past projects I would prefer a variety with repeats. I love the jelly rolls with repeats. Ooh! I love the Chocolate & Roses jelly roll, it’s exactly what I love all rolled into one lovely unit. Scrumptious colors with lovely prints. Not too soft, just the right amount of pattern for interest and color. And it’s Moda. And I also really like the Woof Woof prints in the third jelly roll, so sweet for my deserving Claire Bear. The book completes this lovely giveaway, thanks very much!! Some repeats,love them all,can’t have too many jelly rolls. I like colour choices that really surprise me. Also folk art and print based fabrics. Some repeats! Sometimes I need matched sets and lots of them. One of everything for me please … just like the dessert tray! I like some repeats, for when you need the extra of one or 2 colors/prints. But i love the variety in the jelly rolls! I love variety and repeats are fine. Have much fun with all of them. I love the variety of the colors with the one strip. Love jelly rolls with a variety and a few repeats. I love all the fresh new colors. Precuts are a blessing for me. I have difficulty cutting straight lines! I prefer a variety so like one of everything. I love these book and I’m ready to roll with the All-Stars right now. I’m glad the royalties go to School on Wheels, I think it’s a nice idea. I prefer some repeats, so I have variety but fewer prints. One strip of everything and a few extras thrown in! I love that I can get the whole collection in a compact form, thanks for precuts!!!! I love one strip of everything, please. Thank you! I like when the ratio is equal light to dark and a couple mediums. Easiest to work with for me. I just love jelly rolls!! It’s so hard to say! I think I prefer one of everything, but a few repeats are nice too. I love at least one of everything! But how about a jelly roll + "dessert"? One of each, PLUS some multiples?! Yum! One of everything! Luv all the prints! Oh yes, absolutely, give me one strip of every thing. I don’t want to miss out on anything good from a jelly roll! Love jelly rolls. Prints, batiks, and solids. I love them all. One strip of everything please! Actually I love them all. Looks like another great book. Love, love jelly rolls!!! Made my 1st quilt with them and have been in love ever since. One of everything, I love a large variety. Love jelly rolls, love variety. I mostly like one of everything, but’ll I will use any of them! One strip of everything please. I love a scrappy quilt. The more variety the better. I love one of every fabric, but those solid jelly rolls are great to add to my quilt! You always need sassing. I’m a fan of scrappy so one of each as long as there’s also a good balance of values would be ideal! However, any jelly roll is an irresistable invitation for some quilt play!! Oh these are all beautiful quilts. It would be fun to win. I like repeats. I used my first jelly-roll. I started a simple quilt last week and finished it this morning! I like at least 2 of each strip. I think it makes it easier in case I want to use it more than once in the pattern I have chosen. Sometimes just one is not enough. Jelly rolls with a variety of artsy prints are my first picks. The patterns in the book look great! Jelly rolls with a hand done or hand dyed look are my favorites…examples like from Moda—Debbie Maddy. So many Jelly Rolls to love… is it possible to have two favorites? I love the randomness of having one of everything in a project. A few repeats are nice to get a feel for favorite pattern matches. Prints over solids every time, though!! I like one strip of everything! Allo of them, lol! But I buy mostly those which have 1 strip of everything! My favorite Jelly Roll is one strip of each fabric. This gives me the greatest variety of fabrics, and if there are any fabrics I don’t like, it’s only one of each fabric, which I can use for binding because only a fourth-of-an-inch shows on a binding. This means no strip is unused – so it is very cost effective! Jelly rolls with one strip of each fabric are more bang for my buck, now that’s what I like! One strip of each, please! (I love variety and the scrappy look!) But a few repeats can be good, too! Some repeats- love the patterns in the book ! Some repeats please would be my favorite. I love one of everything a jelly roll allows me the luxury of a full collection without upsetting my purse!! Love the jelly rolls that have the collection range through them as like getting a mixture from a lolly jar. I like jelly rolls with one of every pattern. I find it so much easier to do a scrappy quilt. And balance out the prints and colors. I like 2 of each to use throughout a quilt. I like a strip of each. No , wait a few of each, No that’s not right all the same. okay, I just like jelly rolls and look an amazing book too. I like one strip of each! Thanks for the giveaway chance. Gorgeous quilts. Which one to make first!! I think I like one strip of everything best. Oooh one of everything please! I love variety and the more the merrier. 😉 Thanks for the fun!! I love them all especially a FREE one! I love one strip of every print! The more the merrier! The quilts in the book look amazing. Love working with jelly rolls. I usually try cutting my remnant fabric into strips to be used later. One strip of everything…but I would love anything! I like every piece to be different. Moda fabrics are the best. I love STRIPPING! There is nothing like expose one’s self to so many possibilities. Be free and let it all hang out & enjoy! I love having 42 different prints to give lots of variety! Hi! My choice would be One Strip of Everything Please! Love the Moda All Stars books!!! Just starting to quilt & have not used a jelly roll. Reading the comments of the above quilters, I do like that they can be utilized within one quilt which are included in your book. Spraying with starch & ironing plus separating by color value would be my first step. My heart gets excited with the color combinations included in the packs. Look forward to utilizing jellies in years & quilts to come. Love working with jelly rolls and the scrappy feel they give to a project. Can’t wait for the book, there were several (all) quilts I would love to make. One of everything for a beautiful scrappy quilt! My favourite jelly rolls with a good mix of lights and darks. Enter drawing…. I love these quilt patterns. Some repeats, so I have variety but fewer prints. Great colors in these! I like a jelly roll with duplicates. There’s variety and I like to repeat patterns through my quilt. Jelly rolls are so much fun–I think a mixture of everything would be marvelous and would make an amazing quilt or several smaller projects–table runners, placemats…the sky’s the limit. On one strip of everything! The more the merrier! I’ve always gotten a few repeats in my jelly rolls and I’m fine with that! The more prints and solids the merrier! I like jelly rolls without seriously directional prints, playable color and 100% cuttable design also plays a part. I like jelly rolls with 2 strips of each design. I prefer to have every strip different–the more variety, the better! I prefer a few repeats. I love scrappy but a little controlled. Solids are wonderful too, though!!! One strip of everything, please. I am all about Scrappy. I like to have some repeats and single color rows. I strip of everything please! I like having some repeats in my jelly rolls; however, don’t tell my stack of solid color jelly rolls I said that! Love the solid single colors because they make for quick quilts when combined with my other favorite, layer cakes! Favorite type of jelly roll?? All of the above!! I do really love the ones who who have one of every strip in the line the best though! I’ve never used jellyroll precuts, but would love to give it a go! Thanks for the opportunity to enter this giveaway! I like to have at least one strip of everything in the collection, but two of each is better. I can pull stuff from my stash to add to the variety. I like jelly rolls with 42 different fabrics and then a solid white jelly roll to get started. I love jelly rolls with some repeats. I love all of the combinations in the list but if pressed to choose just one…I’ll choose "some repeats to have variety" jelly roll. I like rolls with all different colors!! Love the variety!! I love pre cuts and this book looks awesome!! 1 stripe of all. Love the quilts from This book! Thanks for the chance. I like one of each as I make mini quilts so I can make loads from a jelly roll!! Few repeats, one strip of everything is delightful! I would LOVE to get the solid color roll. But – HEY! – I would e delighted to win ANY of them. I just love jelly rolls!! If I had to choose what kind I like the best, I would choose a jelly roll with repeats. I prefer jelly rolls with some repeats. Depends on the project. Some need that variety and others simple style. I love jelly rolls because you get a little bit of each design in that particular line of fabric. I just have trouble choosing what I want to use first!! I like jelly rolls with some repeats. Thank you! I like jelly rolls with a repeat. I do enjoy all of the jelly rolls too. Just enjoy quilting! I love colorful jelly rolls! They make such fun quilts! I like to have one strip of everything! I love any jelly rolls. Depend on what I’m making. Love repeats but love to get as many prints as possible too! Guess I just love them all. I like some some repeats in jelly rolls. I love a jelly roll with repeats, usually 2 of each print. I love them all, but bright prints are the best. I love jelly rolls because I am not a good cutter. Jelly rolls offer so much variety and there are lots of patterns out there. One strip of everything offers variety in the blocks created. Also, everything is coordinated, takes out the guesswork. I love repeats of everything because they always make things really look uniform in color and…. thar’s just how I roll! I love strips of different fabrics for a really scrappy look. 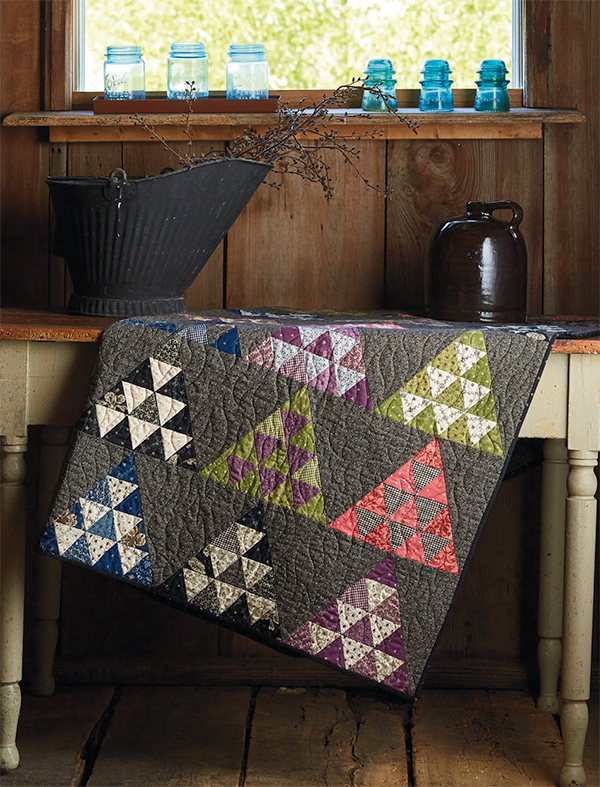 The Moda All-Stars On A Roll book has so many awesome quilt patterns. Will be hard to pick just one; will have to make more than one! Thank you for this giveaway opportunity!! The scrappier the better. I love all types! I like all 3 but would choose a favourite with some repeats for most projects. One strip of everything! I haven’t worked with a solids jelly roll yet, but they are a great idea! I’ve never actually used a jelly roll (gasp!) but I would want a variety of fabrics to play with. Love the quilts in this book. I like a little of everything. I am a very scrappy quilter. One strip of each, please, although, duplicates are ok too. One of each! And I can order more of my favorite! I like jelly rolls with a few repeats. Jelly rolls are so versatile, and I like some repeats, so I have variety but fewer prints. Those quilts go together so fast, and each is so different depending on the jelly roll used. I would love to win the book and a jelly roll. I have received my books from the Warehouse Sale and love everyone of them! A few repeats would be nice of those favorites. Thanks for the giveaways! I like the rolls with repeats. I like to see how one strip will go with several other strips. Makes the quilt have interest but it’s all coordinated. I love them all! Although the variety in a roll of all different strips is a trip in itself, having duplicates works out conveniently. And a solid color roll is almost a must for most projects. There’s just no such thing as a bad jellyroll! Love the book!! I love jelly rolls with a few repeats. I’ve found that the ones that are repeated are usually my favorites, so it’s more of what I love in my quilt. I love all jelly rolls, but especially ones that don’t have repeats. I like jelly rolls with strips that include an entire line with some repeats of some of the strips. Nice variety and the opportunity to use an entire line. ANY OF THE BOOKS WOULD BE A GREAT ADDITION TO MY COLLECTION. WHAT A GREAT CHANCE TO ENTER. THANKS FOR THE OFFER. I love the multicolored jelly rolls that come from a line of fabrics…. they are so pretty! Some repeats. Thanks for the give away! I like 2 of each color, but actually there is a place for all 3 choices. I like a few repeats, even if those repeats are in different colorways. Some repeats is my usual but I love them all!! The more prints the better, but some repeats are great too! Love a variety of colors. Who am I kidding, I just jelly rolls no matter what color. Some repeats please but I love them all. Thanks. I love jelly rolls no matter what! They are so useful no matter what I make. I like one of each, so I can add from my stash and have a huge variety to work with. Opening one up is so much fun! One strip of everything because I separate by colors to get the best results. Love getting to see all the wonderful prints from one line of fabric. Like a variety of prints – love those jelly rolls! I love one strip of everything! This looks like a fun book. Thanks for the giveaway! The more prints I have the better. When the prints are coordinated it seems the possibilities are endless. I have never tried doing a jelly roll project and am eager to try. I like the variety a multi-print jelly roll offers. A few repeats or one of each. It depends on what pattern I want to make! Sometimes I want one of each color and other times having two of each works better. Either way they’re fun to use. It depends on what pattern I want to make! Sometimes I want one of each color and other times having two of each works better. Either way they’re fun to use! I like some repeats–but would love to work with any jelly roll!! One strip of everything, please. I love scrappy quilts! I like variety! So either one strip of everything or sometimes a few duplicate prints. Love jelly rolls! This books looks terrific so thanks for the opportunity to win such a great combination. I love the strips to all be different. More choices to pick from and the scrappier the better! I like a strip of everything in coordinating prints. One strip of everything- but love to have 40 strips. Perhaps a variety of solids and print would be good. I want one strip of each color. I want to see the whole line of prints. I love having one strip of everything, but a few repeats is also nice. All one print can be useful, but not enough choices. One of everything is wonderful, but too many choices. Some repeats help for balance and unity, it’s "just right" for me. I love some repeats. I like to separate by color. I also love that it’s coordinated as well to make it easier to put it together. The book also looks so fun with lots of inspiration! I prefer one of everything, but I just saw the "rule the roost" quilt, and I want that pattern!!!! One strip of everything, please! Depending on the pattern though. I’m obsessed with buying jelly rolls. I can’t wait to buy this book so I can actually make something from my precious stash! I love everything about this giveaway. Mostly, one strip of everything, please! It’s usually my luck that the duplicated strips are my least favorites. I like the ombre effect rolls, too, and then, you need more than one of each strip. I am in a rut, have been doing jelly roll races, some with chips, but never have tried piecing, and this book would get me out of my rut! I like to have 2-3 of each print so I can pair them different ways. I will also cut strips in half before making up strip set for the same reason. As someone else said – it’s scrappy, but at the same time more cohesive. It also makes for I-spy fun (oh look, here’s that print again!). I love a couple of pieces of each strip! Thanks so much! Love to have the scrappy look so one of each would be great! I would love to have the "scrappy" look so one of each and also in a theme related would be great too! For me it has to be one strip of everything. I love the variety. Thanks for the giveaway. I like having a few repeats. It often gives a little more cohesiveness to a project. Sometimes I do not use all of one jelly roll in a project or I need more than one strip to make a quilt come together. I’m happy with one strip of everything. Jelly rolls are just so convenient! Thanks! One of everything and then one more! Amo pois tudo já vem coordenado e fica mais fácil! pena que aqui no Brasil não os encontramos facilmente. Mas vale a pena quando encontro! Amei as tiras "rosa e marrom", o triste é que é muito longe para despachar……mas mesmo assim, parabéns pela iniciativa. Translation: Many because everything is already coordinated and it gets easier! It is a shame that here in Brazil we can not find them easily. But it’s worth it when I get them! I loved the strips "pink and brown", the sad thing is that it is too far to dispatch …… but still, congratulations for the initiative. One of each color please! I love lots of variety! Gorgeous jelly rolls!! Three lucky winners! Woot! Woot! I love a sampling of every thing in the line! Then I like to pick my favorites and get bigger pieces for sashing or borders or backings! I usually like to have a few duplicates, then, if it’s a small project, I can use them for binding. I like repeats – scrappy but still coordinated. Never fails, the fabric speaks to me! Usually two of one fabric is enough, but if you need a plain color to go with another jelly roll or project, that is good, too. They are just so convenient and lots of books and patterns to chose from. I like some repeats, gives me more options, especially if I don’t need the whole jelly roll for a pattern. It all depends on the quilt pattern I would like to make. A good percentage of quilts that I make are for other people and so it depends on the taste of the person and the type of quilt they would like. The overall color palette has to appeal to me or the recipient before I buy it, not the issue of if a roll is single color, scrappy, or with duplicates. I like a jelly roll with one strip of everything. I love scrappy yet coordinated quilts, and this type of jelly roll permits me to make one! I love all jelly rolls! I guess of the three options, I would have to pick the second one. Sometimes you just need more than one strip.of a print. I really love the 1.5″ solid rolls. Big fan of the curved log cabin pattern. Oh my! This is a tough question. I love jelly rolls of all colors, patterns and designs. I prefer rolls that have duplicates because I love a sense of uniformity and balance, but I also love solids because I hate cutting 2.5 strips for sashing. I love some repeat in the Jelly Roll. The book looks great. I love multiple print fabrics with it without repeats. Solids I can cut myself. Pre cuts are valuable since they ultimately save you money by giving you an entire fabric collection in one product. One strip of everything or some repeats are ok.
One strip of everything ! One strip of everything so I can have a variety. A couple of each fabric is enough, but not too much variety. I’ve only ever used a jelly roll once (gasp!) and it had repeats. It worked great for my project but i’d Love to try either of the other two. Would love to have patterns for fabric rolls. Fun new adventure. I like to have some repeats…. I like variety (not more than 2 or 3 the same); however, I don’t think I’ve ever seen a jelly roll that I haven’t liked! I love variety, but I don’t think I’ve ever seen a jellyroll I haven’t liked! I prefer one of each. Makes a scrapper quilt which I love. I like some repeats in mine. I love variety, so prefer to have each strip a different fabric. At least one strip of everything, and duplicates of any of them. I like the mix in a jelly roll. I pie e of everything. I love the variety in the pre cuts. I prefer a jelly roll with a few repeats. Thank you. I’d prefer the variety of having one of each strip. Would love to win this prize! Solid rainbow of colors has been the one I used the most. I like the repeats and one strip of everything. I would love some repeats, as I like variety without too many prints. However a strip of everything could be exciting too. One of everything please! The more variety, the beter. I like having duplicates of each print in a jelly roll so that I have enough of a given print to have an impact. I prefer one strip of everything. Thanks! The strips don’t matter to me. I personally have never used a jelly roll but would love to try one. If I had to chose I think a variety would be best. Thanks for giving away such wonderful fabrics and a book. I love the scrappy look with all different prints. I feel I am cheating if I use solids in a quilt, when there are so many tone on tone that read as a solid. All prints, please. Which one I like depends on the project – but in general, one of everything! I love a scrappy look. So, one strip of each I like the most. I really like some doubles so I can repeat some colour combinations throughout the quilt. I am so excited to try to win anyone of these fabulous rolls! Thank you ! I like one of each, but one or two repeats are fine too. I like a few repeats. I love a strip of everything—-each print in every color! Fun to have 🍀 lucky to have. Choice! I love jelly rolls with a couple of each print-which still gives me nice variety but a little extra of my favorites in the collection. Exciting giveaway! I love using jelly rolls for quick projects! I haven’t used jelly rolls yet. I think I would like to try solids for that burst of color. One strip of each .. i love scrappy with just a bit of planning. My preference is one strip of a wider variety of fabrics for a scrappy project! Jelly rolls are such a time saver! I lean toward rolls of color coordinated prints with some repeats, but solids are a great help,too. Love Moda jelly rolls. Prefer one of each print/blender rather than duplicates. I also like to use a lint roller first, then unroll & separate by color to decide how I want to pair up the strips. Can’t wait to own this book! I have all of the Moda Allstars books except this newest one! Repeats cause I always have more than one favorite. My favorite type of jelly roll is one strip of everything. I love beautiful fun material and designs to work with. I hope I can win the Moda All-Stars: On a Roll book!! I am new to Jelly Rolls – but I like the ones with some repeats. I would like to try a Bargello with rainbow colors. I like some of repeats. Good evening, I enjoy "A strip of everything", add a few creams, whites and such to have a great scrappy quilt. Well if we’re being honest here, I have never bought a jelly roll. I think it would be fun to have one of each. I love some repeats, bigger variety of prints! I prefer to have one of each pattern/color, but second choice is a few of each. I prefer a jelly roll that has a few prints. I find this for me is good as I am not that great at picking out coordinating fabrics. I love working with Jelly Rolls. Enjoy the scrappy look when working with one strip of each fabric, more variety. One strip of each. I like the variety. I don’t buy jelly rolls, but if I did I would want one strip of each fabric in the collection. I do like some repeats. I love one strip of everything please. Adds to a lovely coordinated look.. I especially like the jelly roles with one or two of each pattern strip! They give me a really scrappy look! I’m not picky! All jelly rolls are good, just depends on what project I decide to make. Love jelly rolls! Like both one strip of everything and some matching strips! Jelly rolls are the most creative of the precuts. One repeat is okay but the scrappier the better. I am not all that picky. I love the repeats!!! Solids are great also for mixing them up to make gorgeous jelly roll quilts! !The more color the better!!! always helpful to keep a solid one on-hand for finishing. I DO LIKE THE JELLY ROLLS WITH SOME REPEATS. SOMETIMES ONE STRIP IS JUST NOT ENOUGH! THEY SURE ARE FUN TO WORK WITH. One strip of everything for me please. I like prints most and solids the least. Scrappy is best for me. I love jelly rolls, and I really appreciate having some repeats! I love Moda fabrics. I love my jelly rolls to contain all the prints from the fabric line and a mix of darks and lights. I love Jelly Roll quilting! The only way I was comfortable to start piecing my first quilt was because of them. I love having a piece from every colorway in the design, but it is nice to have the odd repeat. The more prints the better, I say. Thanks for the opportunity. I love all the different prints! I like jelly rolls that have some repeats,this book looks like it has great projects in it! I am so excited to see another beautiful butterfly quilt! I love them all and am looking forward to purchasing this latest book! Hooray for jellyrolls but another HOORAY for your charity – education is the basis for any success. Thank you. I Like one strip of everything please. I love the variety. Can’t wait to get this book. I love the jelly rolls with one strip of everything–variety is the name of the game! Can’t wait to check out this book–they all look fun! Favorite Jelly Roll is one strip of everything, please. Gives me many more combination choices without duplicates. Love your blog – just found it today! I like the variety and a few repeats. Gives me more ideas and ability to have a few favorites in the mix. Thanks for the chance to win! Love the all-star books. Everyone is so talented. I prefer my jelly rolls to have repeats of the fabric line.